NPQ has written about the Newseum’s challenges before. As NPQ’s Ruth McCambridge noted in 2017, since 2010, the museum has had five executive directors. But if its leadership has not been consistent, its financial problems certainly have been, with the museum regularly losing money ever since it moved to its current building a decade ago. A 2013 NPQ article pointed out that there had already been four rounds of layoffs at the museum since it opened on Pennsylvania Avenue. Of course, making ends meet is tough when you carry debt on an expensive building and try to make it up by charging $24.95 for adult admission in a city filled with free Smithsonian museums. In 2016, the Newseum lost $8.2 million. As reported, however, on line 22 of its expense statement on its Form 990 depreciation, depletion, and amortization expenses alone exceeded $12.5 million. Bring down those real estate costs and you might have a less impressive building and address, but perhaps a more sustainable museum. For Hopkins, based in Baltimore, the purchase will certainly raise its profile in the nation’s capital. “With the acquisition and renovation of the Newseum, we will have an unparalleled opportunity to bring all of our current DC-based Johns Hopkins graduate programs together in a single, landmark, state-of-the-art building,” wrote Johns Hopkins University President Ron Daniels. Hopkins will finance its purchase through selling properties it currently owns in Washington, DC on Massachusetts Avenue, internal university funds, and, according to the Post, another undisclosed gift from billionaire Michael Bloomberg. Bloomberg, some NPQ readers may recall, gave his alma mater a record $1.8 billion to support student financial aid at Hopkins last fall. The property, note Anderson and McGlone, includes space occupied by the museum as well as residences on the site. Remodeling is expected to begin in fall 2020, with more than 400,000 square feet of floor space ultimately made available for academic use. The Freedom Forum, Anderson and McGlone explain, was established in 1991 by Al Neuharth, the founder of USA Today. Neuharth died in 2013. His daughter, Jan Neuharth, now directs the foundation. 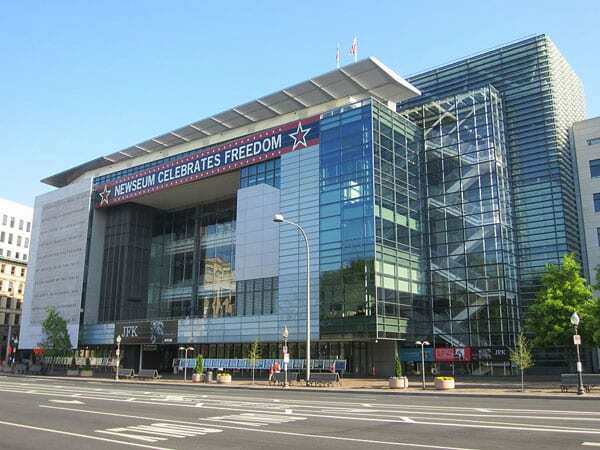 “The building’s pending sale signals the start of a new chapter for the Newseum, which opened in Washington after an earlier incarnation in Northern Virginia,” Anderson and McGlone explain.